Lilac, baby blue, gentle lemon. Pastels have been everywhere this season, and whether you are creating a personal blog or an international company, this is the perfect choice for online stores and individuals alike. 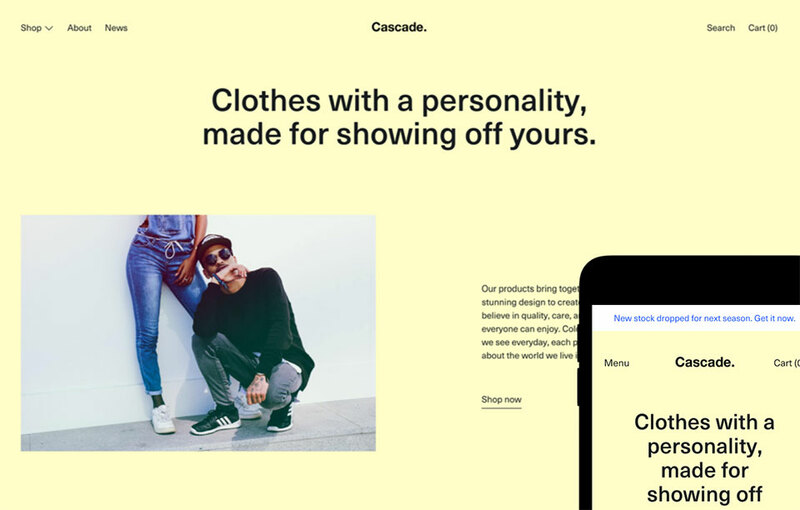 The Cascade theme promises to keep your website looking on-trend, bright and airy just like the most beguiling of high street fashion boutiques. Shopify can be a complex platform to work with, which is why sites such as blackbeltcommerce.com are well-placed to assist in navigating this platform, and can help with SEO, theme customization and content. Milo is a gorgeous website theme that can be used to make Tumblr blogs look like esteemed websites. The black, minimalist interface is perfect for any type of website, and it is optimized to make an array of eye-catching mobile versions of your site too. If you like the template but not the dark aesthetic, it is very easy to change the colors of the theme to any hue that you desire. It’s mean and stripped-down and means that your content will completely run the show, relegating all else to the background. Great for e-commerce stores. This is a superior website theme that is perfect for any business. There are over 12 million online stores to compete with on the internet, and by utilizing ‘Sydney,’ your e-commerce site will enchant users with a contemporary aesthetic that means business. Sydney allows users to customize every element of their website theme to a high standard and includes layout control, images sliders and sticky navigation. It’s a delight to use and to alter, and requires not a lot of coding experience to understand and tinker with. This is a website theme you can trust to work ceaselessly from any browser. Reaching for new heights in the digital sphere, HTML5 is surely the future for website design with an edge, so it is well worth investing in now while the iron is hot. This is an advanced theme with easy-to-customize color schemes and backgrounds. This website theme enables users to include parallax elements to their CSS to enable ceaseless scrolling for a highly superior touch. Whether you’re a content-heavy platform or you’re selling hundreds of items, this is a theme to support your huge bed of pictures and text. The aesthetic of a website is a large part of a modern business brand and is something to be taken seriously. Fortunately, there are a healthy plethora of website themes to choose from that require minimal coding experience, like the four recommended above.